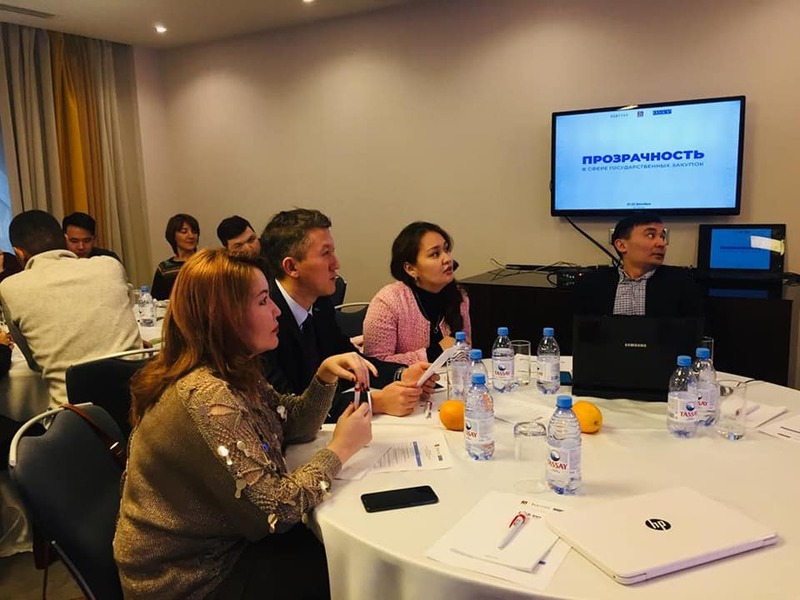 On December 22nd, IDFI participated in the training for Journalists and CSOs in Astana, Kazakhstan, as a part of IDFI’s advocacy efforts in the framework of the project Transparent Public Procurement Rating (TPPR). The 3 day training was organized by Organization for Security and Co-operation in Europe (OSCE) and CSO Zertteu Research Institute (ZRI), based in Kazakhstan. Representative of the Agency of the Republic of Kazakhstan for Civil Service Affairs and Anti-Corruption was also taking part in the training sessions. During the training sessions, IDFI’s Head of Research Direction – Giorgi Lomtadze discussed Kazakhstan’s Public Procurement Legislation, its strengths and weaknesses, as according to the TPPR assessment methodology. The journalists and CSOs had the possibility to provide their opinion on the current state of public procurement system in Kazakhstan and share thoughts on ways to improve the current situation. Public procurement in Kazakhstan is regulated by the 2015 Law on State Procurement. The PPL applies to ministries, state agencies, companies and enterprises in which the state holds more than 50% of the shares. As Kazakhstan is part of the Eurasian Economic Union (EEU), the PPL of the country complies with the standards of the Union. The procurement system in Kazakhstan is decentralized with different government agencies and companies managing specific procurement projects. The functions of law-making, monitoring and coordination are divided within two state entities. The Ministry of Finance of Kazakhstan develops procurement policies and the Committee for Public Procurement is responsible for enforcing the laws and regulations on public procurement, as well as gathering statistical information on public procurement. Kazakhstan has a single portal for hosting public procurement information - goszakup.gov.kz and the focus of the training was the advantages and disadvantages of this system. An important advantage of the PPL of Kazakhstan is that procedures are 100% electronic and paper-based procurement is not possible for competitive procedures. The new portal offers detailed information (most of it in JSON format) on the procedures starting from the planning till execution. Nevertheless, IDFI discussed the weak points of the PPL of Kazakhstan and provided several recommendations to improve the existing law and e-procurement system. One important issue with Kazakhstan is that, the PPL of the country and its transparency guarantees do not fully correspond with the existing e-procurement system and the levels of transparency it provides. Despite the fact that the new portal provides much of information on the pre-tendering and tendering phases, the portal does provide exhaustive information on contract performance (payment receipts, quality control reports). 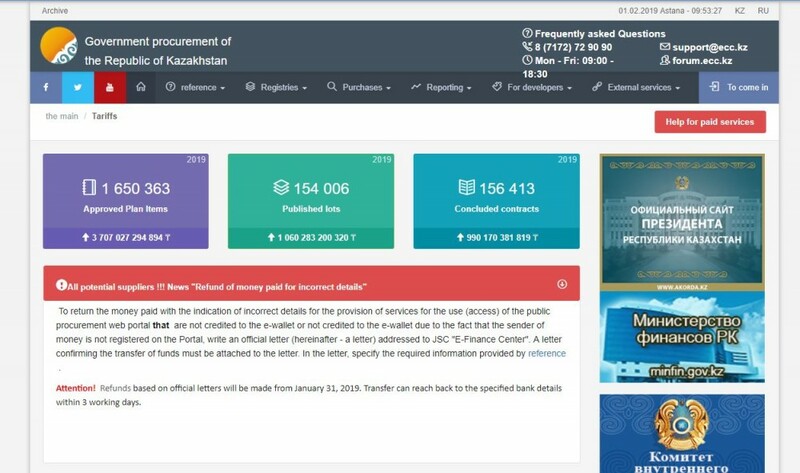 Publishing contracts and acts of delivery and acceptance are legally obligatory, therefore adding payments and quality reports to legal guarantees will enhance the monitoring capacity of the e-portal of Kazakhstan. Additionally, no obligation in the legislation to consult with civil society or with the business community on the functioning of the public procurement system in Kazakhstan diminishes the level of accountability in public procurement and hinders healthy discussions on how to improve the system. One of the problems discussed during the training was the vast list of exceptions to the PPL in Kazakhstan and the negative effects this may have on several sectors of the economy. One particular sector deliberated was procurement of services of media organizations (printed, online, TV, radio), which in Kazakhstan, is completely outside of the PPL. Transparency and competition in this sector is not studied as of yet, however, lack of competition in the sector is often linked to government effort to control the media through direct contracting and favoritism. IDFI’s representative also talked about the importance of an independent dispute settlement mechanism for procurement procedures. This mechanism can incorporate representatives of academia, CSOs and the business, along with the relevant authorities, which will enhance the trust of the business towards the system. In this regard, examples of Georgia and Ukraine were discussed so as to see the benefits of an independent mechanism for public procurement disputes. Kazakhstan has a solid public procurement framework, which ensures sufficient level of transparency. Nevertheless, improvements can be made and examples of other countries can be used to further enhance public procurement procedures in Kazakhstan. Maximum level of transparency, access to information in machine-readable (open data) formats, reducing the list of exceptions from the law and the possibilities of direct contracting are essential to Kazakhstan’s overall success in the area of public procurement. Improvements may be beneficial for levels of competition in public procurement as well as citizen engagement in the process of monitoring public procurement. During the training, IDFI’s representative discussed the possibilities of further cooperation with ZRI and the representative of the Anti-corruption Agency. Plans were made to provide specific recommendations on multiple aspects of the law, by comparing Kazakhstan’s PPL with those countries that received higher scores. The next advocacy visit in Kazakhstan is planned in the period of February-March.